Each activity chosen to be part of a classroom curriculum is designed to foster social, emotional, physical, and intellectual development. The whole child is a complex set of needs. The activities must correspond with the attention span, developmental stage, and interests of the children in the group and then must be adapted to particular needs. Ours is a "hands on" program. Concepts to be taught are facts that will be presented to children through projects, activities, fingerplays, and stories, carefully thought out by the teacher and presented so that concepts taught are reinforced through repetition and variety. Remember when more than one sense is stimulated, learning is improved! ART-ACTIVITIES include projects that develop imagination, individuality, and aesthetic appreciation. Art not only develops eye-hand coordination and large and small muscle control, but in addition, is a good release for emotion. 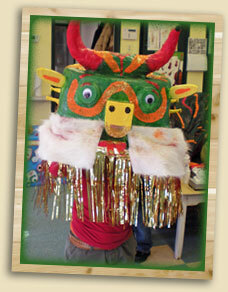 Therefore, the children must be allowed to do their own art-work and express themselves in a creative way. COOKING ACTIVITIES... a favorite at Merrick Woods. Cooking incorporates foods from the basic Four Food Groups that are low in salt, sugars and fats. Because good habits develop during early years, we introduce our children to a balanced diet of nutritious foods. Recipes are kept simple and children are always involved. Although cooking is "just plain fun," consider the learning involved in a simple recipe; ---cooking is math, science, vocabulary, and classification. FINGERPLAYS are simple poems children recite while performing appropriate actions. They train listening and response skills, rhyming, and memory .Fingerplays are an excellent transition between activities, and a wonderful way of reinforcing the teaching of new concepts. LANGUAGE DEVELOPMENT includes discussions, word games, flannel board stories, books, and experiences to increase communication skills. Articulation is an important part of our program. Learning vocabulary through the use of the above mentioned activities gives a child a happy, secure feeling when entering into a conversation. The name ofour game is SECURITY. Here at Merrick Woods, all our children are winners! GAMES & SOCIAL ACTIVITIES foster the ability to interact properly in a group. Rather than emphasis on "winning," the playing of the game should be stressed. Coping in social situations is an important part of a pre-schooler's development. 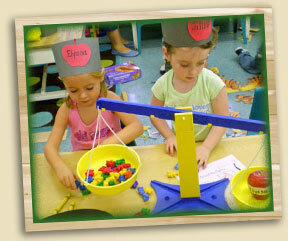 CREATIVE DRAMATICS & MOVEMENT implements use of puppets, blocks, dramatic play area, dramatics, and movement. It encourages free expression and group interaction. Dramatic play facilitates role play and recreation of life experiences. Blocks are arranged according to size and shape and reinforce math concepts and spatial relations. MUSIC includes simple songs. The enjoyment of music is more important to us than singing in tune. Rhythm instruments are used to encourage creative movement. Learning simple songs reinforces memory skills. FIELD TRIPS are used for total learning experience reinforcement. Related activities should be incorporated (for instance, bake before visiting a bakery). PHYSICAL DEVELOPMENT... includes games and exercises which increase physical skills and coordination. Indoor and outdoor activities for fine-gross motor skill development are stressed. MATH includes games, activities, and materials that provide a foundation for understanding mathematical concepts. These are incorporated into a daily routine, using concrete objects to teach abstract concepts. Math includes counting, identification of shapes, one to one concepts of quantity, terminology , measurements, classification and comparisons, money and time. SCIENCE plays a large part in our program. We emphasize experiments and observations to increase awareness of the world. Concepts that are routine and familiar to adults are sources of wonder and discovery for children. Simple projects are set up so that children are allowed to experience the joy of discovery. 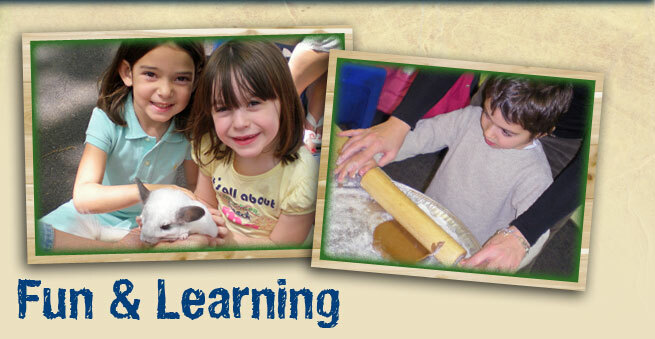 Our children are taught to respect all living things through participation in caring for classroom and school pets.